If you’re looking to take your photography game to the next level, you’ve probably considered making the jump from your smartphone or point-and-shoot to a DSLR. Due to the ability to switch out lenses and adjust every setting imaginable, digital single-lens-reflex cameras, more simply referred to as DSLRs, are the tool of choice for new and seasoned photographers alike. Once reserved almost exclusively for professional photographers, DSLRs have gone mainstream with entry-level models starting at just a few hundred dollars. The latest DSLRs offer stronger performance and features than earlier models, as well as the ability to capture high-quality videos. 2018 will bring lots of new camera tech, but it’s still a great time to buy. So if you’re in the market for a new DSLR or looking to trade up, here are our current favorites. Why should you buy this: It’s a versatile, strong DSLR for photos and videos. If you had to buy just one DSLR, make it the D500. Nikon packed this camera with so many features that it’s the most versatile DSLR you can buy. The 20.9-megapixel APS-C sensor should satisfy a wide range of photographers, and support for 4K (UHD) at 30p makes it a capable video camera. Although Canon’s EOS 80D has a more superior autofocusing system for video and a lower price, the D500’s strong feature set, along with excellent capture quality for both photos and videos, puts it ahead of the competition and is worth the premium. It can deliver clean shots up to ISO 12,800 and even 20,000 if a wide-aperture lens and tripod is used, but if you want to go wild, the D500 can hit a high ISO of 1,640,000. Nikon also introduced its new Snapbridge 2.0 wireless connectivity system in the D500, which uses Bluetooth to handle low-level functions with a smartphone, like transferring downsized photos you can use for the web, or upload to the cloud. Another advanced feature is support for XQD flash memory, which is quicker than the fastest SDXC card – handy for sports photographers, since the D500 can shoot bursts of 10 frames per second (fps). Ultimately, its image quality won us over. As we said in our review, the D500 holds its own against more expensive full-frame cameras — it’s one of the best digital cameras you can buy — and Nikon pulled out the stops in creating its flagship APS-C DSLR. Why should you buy this: This versatile full-frame camera delivers fast autofocusing and 4K. Full-frame cameras tend to be well-built across the board, and there are a lot of excellent options. But Canon’s new EOS 5D Mark IV is our pick. For the price, you get a lot of Canon’s latest tech inside a camera body that isn’t much larger than midrange APS-C DSLRs – great for sports photographers who need to run around or carry multiple cameras. In our hands, the camera felt comfortable to hold, especially during one full day of shooting, from morning to night. The 5D Mark IV is a full-frame camera that will appeal to pros and enthusiasts, particularly those moving into full-frame for the first time. Besides a newly developed 30-megapixel full-frame sensor and the latest image processor (Digic 6+), the 5D Mark IV uses a 61-point autofocus system and Canon’s Dual Pixel AF system, which provides fast autofocusing when in live view mode. The camera also introduces Dual Pixel RAW, which lets you correct focusing errors afterward. Even in the dark of morning and night, we thought the autofocusing was fast. The camera also has faster continuous shooting, at 7 fps (unlimited when shooting in JPEG), and it’s the first 5D-series model to include Wi-Fi/NFC and GPS. Dual card slots (CompactFlash and SD) lets you write RAW to one and JPEGs to another simultaneously, or use both for redundancy. 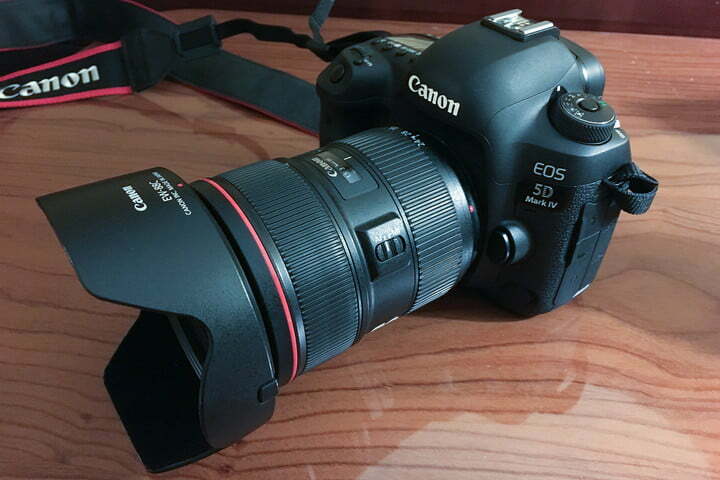 The 5D Mark II launched the trend of DSLR filmmaking. Although the 5D-series is no longer the standard bearer, Canon brought 4K video capture to the 5D Mark IV. The camera shoots very good videos, particularly at Full HD 1080 at 60 fps, but 4K video is cropped and the camera does not support 4K-output via HDMI, so videographers may find the 5D Mark IV limiting for a 4K workflow. Canon’s latest 5D is a stellar, versatile full-frame camera that will suit many photographers, whether on the go or in the studio. While it has some nitpicky cons in video, it’s also a strong camera for videography. If you want a camera with faster burst speed, you should look at the Canon EOS-1D X Mark II or Nikon D5. For high-resolution stills, the Canon EOS 5DS is better suited for portrait work. For everyone else, the 5D Mark IV is our go-to. 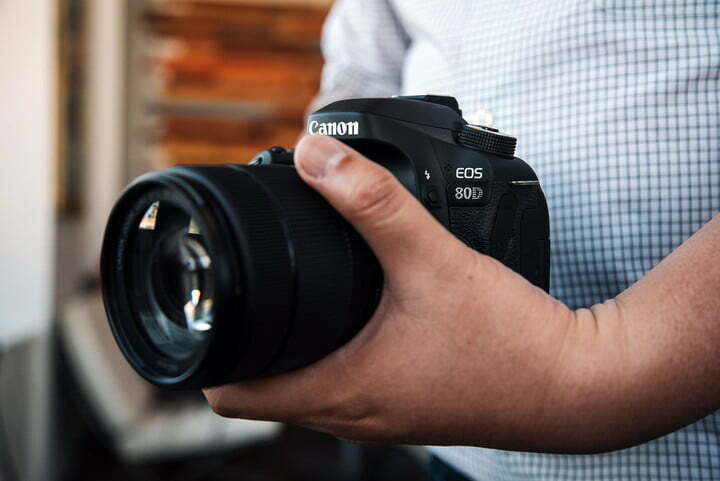 If a full-frame camera is less of a priority for you (that’s the case for the majority of DSLR users, as APS-C sensors have become strong options), consider Canon’s EOS 80D. It may not have all the bells and whistles of the overall winner, the Nikon D500, but it’s half the price and you get a lot of great features and performance for the money. While the 80D lacks support for 4K video, it shoots excellent Full HD 1080 movies at 60 fps. It uses Canon’s Dual Pixel CMOS AF system, giving the 80D one of the best DSLR autofocusing to date, with outstanding subject tracking. Canon added a headphone jack, allowing a user to monitor audio quality while filming. For owners who shoot with Canon’s entry-level Rebel series, the 80D is a good DSLR to step into. For enthusiasts shooting with the previous 70D, there are enough enhancements in the 80D that make it a worthy upgrade. Looking to buy your first DSLR? Nikon’s D5500 is a good place to start. It isn’t Nikon’s least expensive DSLR (that recognition goes to the D3300 and D3400, which are both also very good), but the D5500 offers quality 24-megapixel photos and more useful features, for only a bit more money. The D5500 lacks the build quality of the enthusiast-level D7200, but it uses the same 24.2-megapixel APS-C sensor that produces great-looking photos. This is due in part to the lack of an optical low-pass filter for increased sharpness, as well as a 39-point autofocus system. It’s not the fastest DSLR you’ll find, but it will handle casual action with aplomb. Despite its entry-level status, the D5500 can shoot Full HD 1080 videos at 60p. There is a microphone input for connecting an external mic to capture higher quality audio – something you won’t find in the D3300/D3400. While you’re guaranteed to get excellent stills, the D5500 isn’t too shabby for amateur videography either. And to help you frame your shots in live view mode, there is a vari-angle 3-inch touchscreen LCD that flips out – also not found in Nikon’s lower-end models. Built-in Wi-Fi lets you control the camera remotely with a smartphone, or transfer photos to post on the web. If there were one caveat, it’d be the so-so 18-55 kit lens. 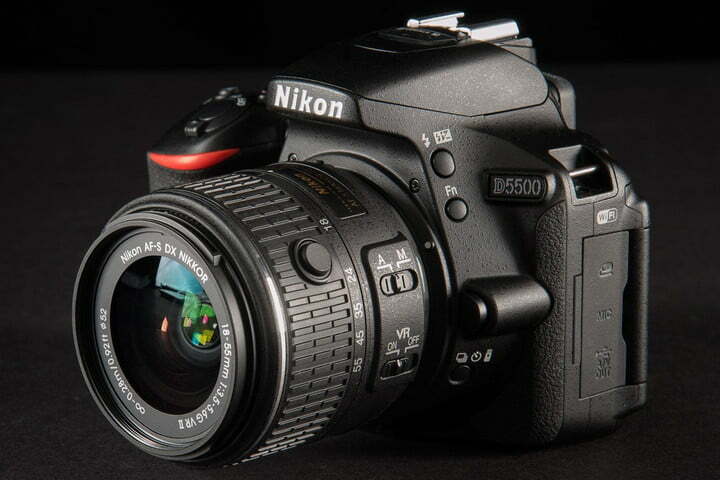 We recommend purchasing the D5500 body only, and investing in a quality Nikon lens. The stronger lens not only offers better performance and image quality, but it will grow with you when you upgrade to a new Nikon DSLR. If Canon lenses are more to your liking, consider the Rebel T6S as an alternative. 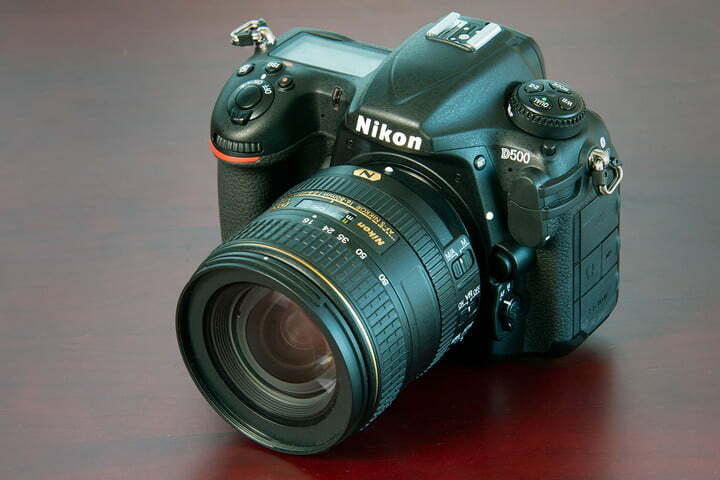 Note: Nikon recently announced the D5600. The new model adds Bluetooth (SnapBridge) connectivity for always-on pairing with a smartphone and quick image transfers. It also adds a time-lapse option found in the higher-end D7200. In terms of camera specs, the D5600 is nearly identical to the D5500, which remains in Nikon’s lineup, at a lower price. To find the best models, in addition to image quality, we factor in criteria such as speed, low-light strength, video performance, durability, and any unique features that help them one-up the competition. Our selections are based on our long- and short-term testing, experience with earlier models, familiarity with the companies’ technologies, and consultation with industry experts, fellow journalists, and users. We also check out online forums, look at lab results (such as DxO), and read other third-party reviews. We look across the board – not just our own experiences – to find consensus on what we think are the best-performing cameras you can currently buy. We also look at list pricing to determine if a product is worth the cost, is available, and future proof enough to recommend. We may even recommend cameras that aren’t new, provided the features are still best-in-class. The camera market evolves constantly, with manufacturers often introducing better models with new features. So, you can expect our picks to change, as well. But don’t worry: The models you see here will be with you for some time, and if we anticipate there could be better models in the horizon, we will state that upfront to help you decide whether you should buy now or wait. DSLRs remain the workhorse cameras for many photographers, from beginners to professionals. Paired with a strong lens, most modern DSLRs are capable of shooting terrific images. Advanced models offer stronger performance, more features, and better construction, but they’ll also command a higher price, naturally. A DSLR is a type of camera that uses interchangeable lenses, and because of the similarity, it’s often confused for mirrorless cameras, which also use interchangeable lenses. DSLRs use mirrors to reflect light from the lens to the optical viewfinder (OVF); when the shutter button is pressed, a mirror flips up to allow light to hit the sensor. Mirrorless cameras do away with the mirror system and OVF (hence the name). Because of the mirror, DSLRs tend to be bulkier than their mirrorless sibling. However, the OVF shows a more accurate picture (it’s an exact reflection of what you’re shooting), and performs better in low light. DSLRs also offer stronger autofocusing, as well as larger lens options and better battery life. Although many of the latest mirrorless cameras have caught up in performance, making many on par with DSLRs. Canon and Nikon are the dominant DSLR manufacturers. You’ll also find strong options from Pentax (which has a loyal following) and Sony, but the majority of professionals use cameras and lenses from Canon or Nikon. Current DSLR, your camera options will be determined by your lens collections.